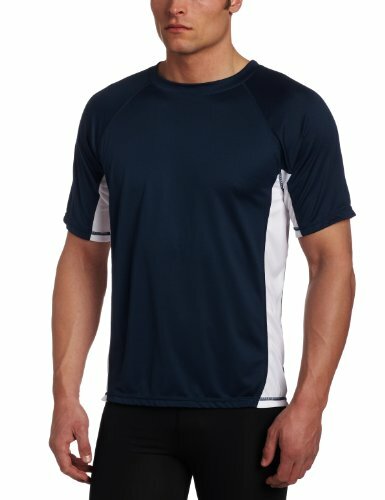 Kanu Surf Men's Big CB Extended-Size Rashguard UPF 50+ Swim Shirt, Navy, 2X | What Should I Say? Kanu surf presents our newest swim tees with a much looser fit than traditional rashguard for yet more comfort and versatility. Kanu surf, a surf and swim lifestyle brand, is well know for great fit, function and colors along with high quality functional apparel for the whole family. All of our rashguards are quick dry and feature a upf 50+ rating to block out the sun's harmful rays. Kanu swim tees are designed for surfers of all levels as well as the recreational athlete. They are ideal for running, swimming & working out as the fabric features wicking technology and helps keep moisture away from the body. They are great for trips to the beach or the pool as well as for lounging around. Matching styles for kids are also available so dads and kids can hit the beach scene as a team. Available in s-5xl. If you have any questions about this product by Kanu Surf, contact us by completing and submitting the form below. If you are looking for a specif part number, please include it with your message.